And that’s how the Make me Feed Full package was born. Creation of feeds from external sites with full content. 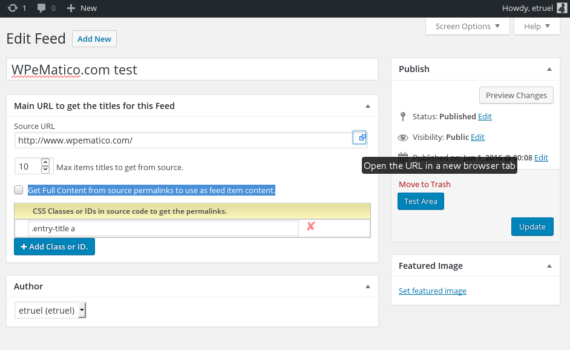 Create RSS 2.0 feeds with content extracted from external websites regardless of whether they have their own feed or not, to show on your WordPress blog as an individual page. You can copy the template used to view feeds to your theme’s directory and customize it to your liking. 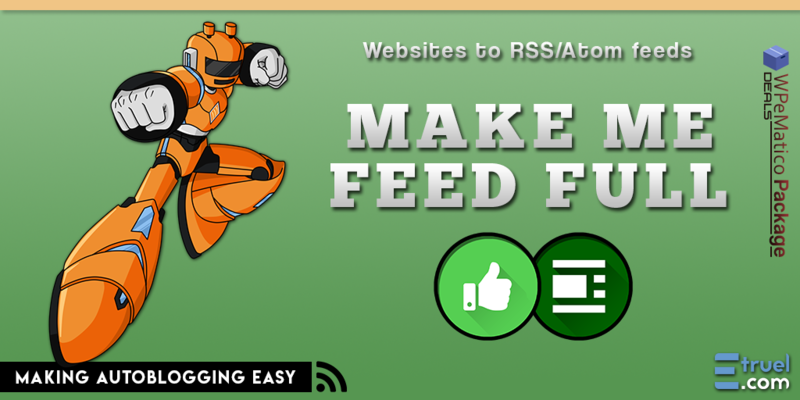 It has a page template for the Custom Post Type of make-me-feed which is used to show the generated feeds in standard xml format for RSS 2.0. For advanced use, you can copy it to your theme directory in WordPress and customize its format or tags according to your needs. Option to create private feeds to see them exclusively when connected to the blog. Just like WordPress allows you to create private posts, Make Me Feed has this option, which lets you configure feeds privately so that they can only be viewed by users who are logged into your blog or with an access code. Personalize the number of items per feed. You can limit the number of items or posts to show in each feed created. Text field to indicate the attribute to search for in the DOM of the HTML that contains the link, for example, ‘title’, ‘permalink’, etc. You can specify portions of HTML by ID or class, just like you can with jQuery, to obtain the destination link within the selected tags. You can use the Firefox tool by right-clicking on any of the titles to obtain, and in the drop-down menu, clicking on “Inspect element”. In this way, you can copy the attribute of the HTML tags for the links to obtain. Analyze the relative URLs to follow the complete route of links or images. The addon corrects the relative paths and places the complete URLs in each feed, thus preventing the loading of nonexistent links to images, downloads, etc. 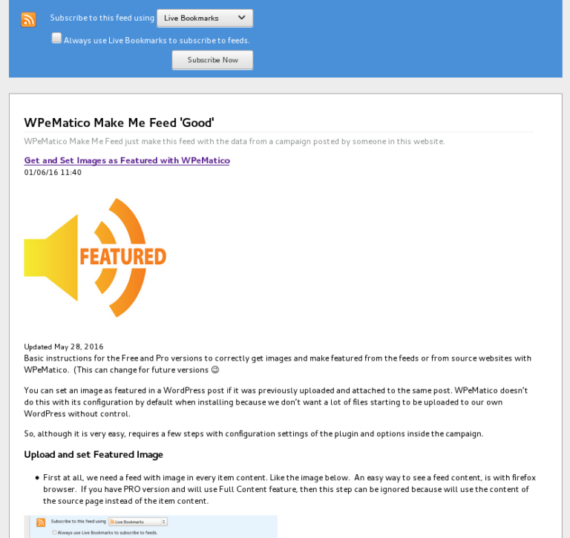 Use the WPeMatico Full Content addon independently. You can also use the Full Content addon with the campaigns of WPeMatico to extract complete content from the URLs of the feeds. By simply creating a new feed and filling in some fields, you’re ready to generate your feed. Complete HTML ID or class that identifies the links in the titles of the notes. If you want to use another format, like Atom, the feed obtained can be modified by editing the page-template file. WPeMatico is autoblogging in the blink of an eye! 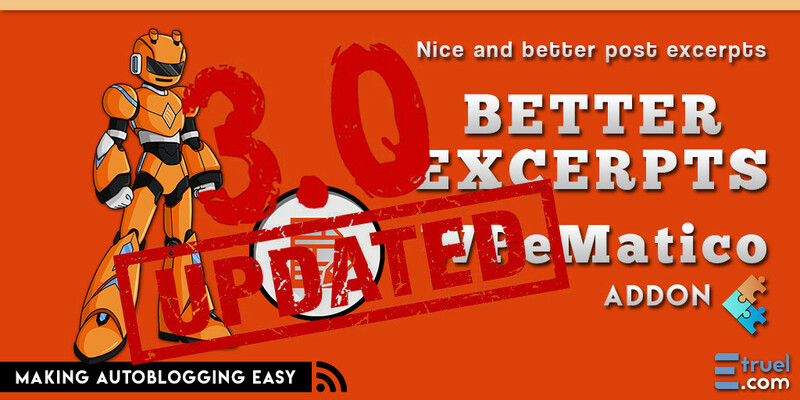 On complete autopilot WPeMatico gets new contents regularly for your site!